Dreamy and fairy designed 'picture book-style' box 『Lafary Story Box』 is released. Series 1 is named DREAM. The fantastic story of Lafary has begun from here. The original story and dreamy picture invite you to the fantasy world. Chou ribbon packed in the Story Box. Not only as a hair accessory, you can also use as a charm for your school uniform, bags and more. 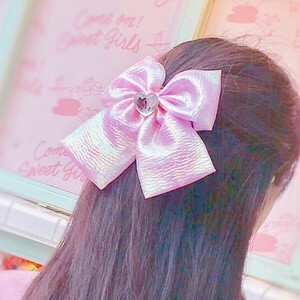 Aesthetic pink ribbon is pretty cute for matching coordinate and for any events. For the International Shipping from Japan, please choose [international orders 1000円] for shipping method. Shipping fee abroad is ¥1,000. Please make sure that you input the correct information for the application form. Otherwise, your order will be canceled. COPYRIGHT © LafaryShop ALL RIGHTS RESERVED.